Just had fun building these three Softrock v6.2 lite SDR RX ready for operations in New Year. They will go into a single chassis along with other bands. I bought a Delta 1010 LT which is a 10 input 10 output PCI sound card earlier in 2007 and will look at creating an all band SDR RX with it. As did all the shopping etc for xmas happy to put my feet up. And whilst doing that made up some new etch and used a new digital thermometer to check the bath is at 50 degrees C. The etch was really fast this time. These are top left; a N3ZI LCD display controller boards, top right; a Freakin' Beacon controller, bottom left; KD1JV (see earlier post) and botton right; one of the RD16HHF1 Mosfet PA boards (sea earlier post). Whilst waiting for the etch I melted a little solder for a couple of N6BM projects, the Miniboots II PA and an LC Meter. 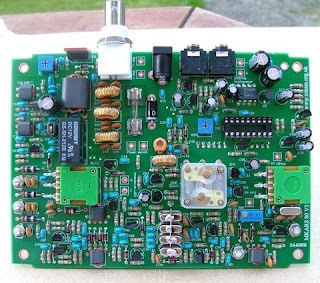 The LC meter design is actually from MARC http://www.marc.org.au/index.html VK3BHR LC Meter Project - Mk.II but Wayne had reworked the PCB layout. I have a nice desktop calculator style case that one will go into. As I operate /P from time to time using a battery monitor is always a good idea. Right now I use a small digital multi meter from Conrad (Friedricshafen 2007) but I can see the benfit of fitting one of these to a rig. 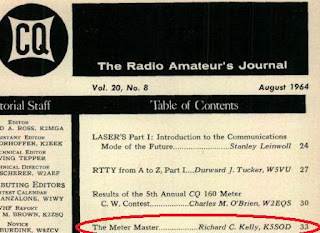 There was bit of a post the other day on qrp-l for the battery monitor from qrpkits (N7VE) Dan Tayloe and the one from (KD1JV) Steve Weber was also mentioned. 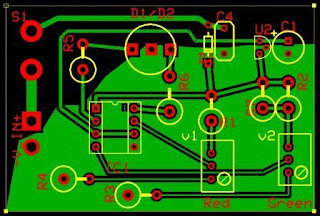 Well I have put together a couple of PCB for both with the same sized PCB. There are a few differences in that one requires tracks on both sides. One uses a 7805 as a voltage reference the other uses a 3.3V zener diode. I have some 431CP voltage reference semi conductors and I will try one of those as well if the other option is not accurate enough. As I will homebrew them I will use components I have. 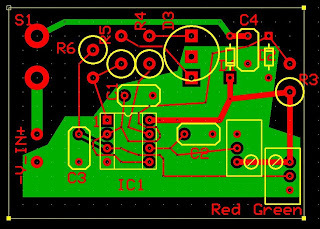 Building the N3ZI LCD Digital Display and making up PCB. for it. 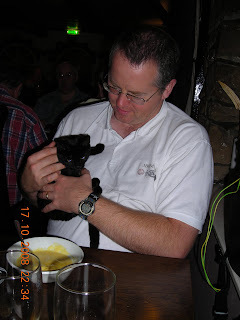 At FDIM 2008 I had a few chats over lunch with Ted Bruce editor at QQ who later sent me a couple of these MOSFET and I said I'd work them into a little qrp amp of some sort. (And write it up for QQ of course!). 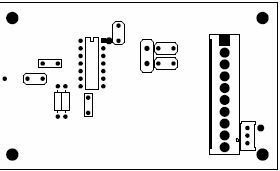 Here are some preliminary images of the PCB fabrication after the ugly looking prototype worked. The production method uses press n peel blue film (glossy photo paper also works) and an iron on transfer to PCB before etching. 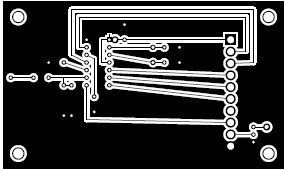 So using Express PCB (www.expressspcb.com) I create a PCB layout. Print it out onto paper and cut out the layout. Then tape a square of Blue Press n' Peel film onto the reverse of the paper where the layout has been cut out. And hey presto one PCB mask for transfering onto a fresh piece of PCB. Expecting to get some time in the shack this Xmas I have pre made up these boards and a few others so I can make a fresh batch of etch and take that down with me. The PCB will be about 2" square. Note there are NO LPF components fitted to this PCB they will be needed. The populated PCB will be fitted onto the lid of a Jack Daniels minature tin and I am using a 1U solid copper PC CPU heatsink and fan for cooling. The RD16HHF1 will be mounted under the board. 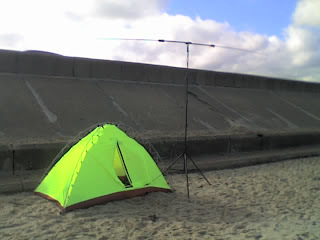 Not all /P operation M1KTA does on a beach is from some tropical DX paradise unfortunately. 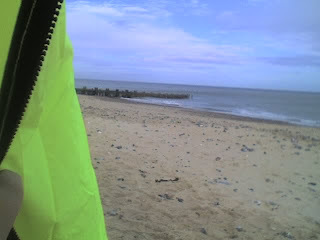 I braved the cold from a beach on the North Sea coast using a homebrew expedition tent I made a while back. 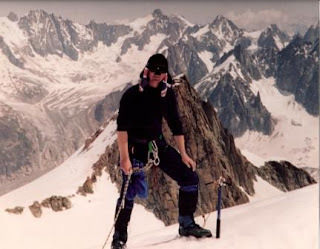 The tent is self supporting and also contains a sling running through the tent wall to tie into ice screws etc when in the mountains on steep snow slopes. It took 1/2 day to cycle there, and after realising had forgotten the SLA battery... oops, fortunately found a cafe that had a box of rather old sun bleached packets of AA batteries I bought for £1. 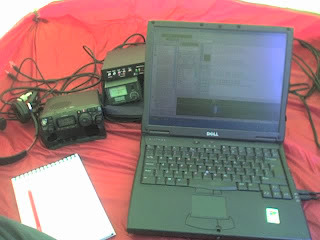 Operation into a buddipole from FT817 with psk31 0.5W running using only the old batteries with a VERY OLD Dell laptop whilst the batteries lasted. 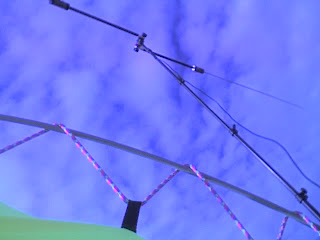 It was light enough to operate inside the tent but brrrr... it was cold. This was the same place where I operated from and sent a message to GQRP about the sea wall effect so thought I'd try it again. Just checking where the tide is. The bottom of the tent is a red fabric and there is plenty of room to sit and operate sitting up. When the door is zipped up (There is a vent in two walls I can close from inside) the tent is wind and water proof. Having just put the LF antennas up again and got the shack prepared for evening/night time operating over this xmas I (M1KTA) will attempt some 137kHz operation CW and QRSS and I expect will work some cross band 500kHz-80m CW.